If you’re looking to create some excitement in your home, Moroccan style offers a thrilling blend of luxury, adventure, and mystery. Morocco’s varied geography, along with its blend of many cultures, has created a striking style that is emulated all over the world. 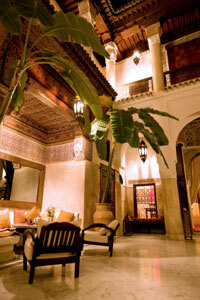 Moroccan interiors honor the natural outdoors, with elements like terra-cotta tiles, natural stone, and exotic plants. A home can be transformed into a glamorous oasis using Moroccan style. Moroccan colors are inspired by its geography. Vibrant oranges and reds from the sun are paired with the deep blues and sparkling greens of the sea. Throw in some golden yellow (sand), silver (moonlit desert), and ochre (mountains), and you’ve got an electrifying mix of colors that evoke the Moroccan mood. Moroccan style blends a multitude of textures to create a warm, inviting feeling. To establish that mood, toss layers of fabrics on furniture, use several area rugs, and add texture to your walls. Set large woven baskets atop a smooth stone table for a wonderfully Moroccan combination. Moroccan-style furniture is often hand-carved from wood. Upholstered pieces use natural fibers. Accessories include handcrafted leather items, perforated metal, blown glass, mosaic tiles, and woven textiles. Wrought iron can be used for banisters and gates. Add a colorful mosaic table to brighten any room. Metallic ribbon can be hung from walls or tossed on floors and furniture. Large silk pillows and jewel-toned throws are the perfect accents for a sofa. And don’t ignore the value of scent as an accessory. Exotic spices can be used as potpourri to immediately take your mind to Morocco. Whether your goal is to create an entire home of Moroccan style, or just add a touch of Moroccan flair, you will enjoy the exotic ambience that this style evokes. Orange is definitely a color that draws attention. It evokes feelings of excitement and enthusiasm. Orange increases the body's metabolism and heart rate, making you feel happy and energetic. There is nothing even remotely calm about orange. Despite its cheerfulness, pure orange is often too bold and brilliant for use in interior design - at least as a main color - but it's a wonderful color to use as an accent. Toss some orange pillows on a subdued couch to brighten up a room. Add a vase of bright orange flowers to enliven a space. Paint one wall orange as an exciting focal point. Tints of orange are very popular in home design. Think peach, apricot, and terra cotta. These orange shades create warm, welcoming environments. When you're ready for more fun, think orange!